While customizing Salesforce for clients, as developers, you may come across scenarios where the user will not have a Salesforce login as well as a community login. Purchasing a Salesforce license for a minor update or activity might incur heavy license cost for the user, and you cannot dictate your client to do so. At times, medium scale businesses might not have many community requirements. Purchasing community licenses for a user who needs to do some small inputs from customer accounts also can cost them dearly. Such users without multiple requirements mostly depend on Force.com sites’ guest user license for gathering customer inputs. This type of guest user license is free of cost. You can actually perform the required tasks as a guest user in Force.com sites. Many industries using Salesforce will come across similar situations. A common example is that of pharmaceutical companies. 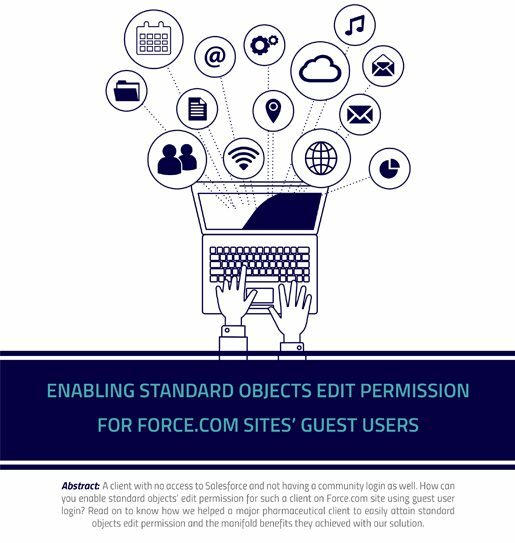 This whitepaper covers a workaround that Suyati’s Salesforce team implemented for the pharmaceutical client in force.com to edit standard objects (as Force.com guest user).Download our copy of the whitepaper and find out how to enable standard objects edit permission for force.com sites’ guest users.